The offered support reaches from evaluation and support of planning and management of downhole logging programs within ICDP proposals to the actual performance of entire or parts of borehole logging sessions. 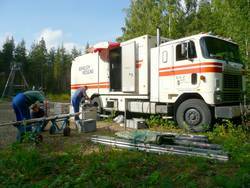 Our assistance in preparation of borehole logging programs comprises check of availability of equipment & expertise, equipment acquisition and cost assessment. If desired the OSG can carry out downhole logging measurements with a special equipment fitting most ICDP operating conditions. OSG offers logging service for ICDP projects. OSG logging can complement any other logging plan or form the entire downhole logging of a project. Costs are minimal and comprise only very low tool utilization costs and travel/transport costs of personnel and equipment. No depth or measurement charges and no personnel costs are imposed but these are borne by overall ICDP funds. The low costs enable downhole logging even for ICDP projects with a low budget. Based on the most frequent requirements of ICDP projects we established an ICDP downhole logging equipment with slimhole probes and suitable logging winches. The tool specifications allow utilization in very different hole conditions. We also operate logging tools and winch systems owned by GFZ Potsdam. OSG cannot and will not compete with commercial logging service providers. OSG preferably recommends the use of commercial services if these provide higher resolution and/or quality and if the project budget allows. A logging contract treats duties, rights and non-liabilities of OSG and the orderer (one or a group of principle investigators). A pre-operation checklist finds out about all logging conditions and has to be filled out by the orderer(s). Availability of OSG services is handled on a first-come-first-serve basis. As there is only one OSG logging team a delay in a preceding project potentially might cause unavailability of OSG services for the following project.